Racing driver Jack Butel will be bringing his Ligier JS P3 LMP3 machine home for the RUBiS Jersey International Motoring Festival on 1-4 June. The exciting sports prototype will make its first trip to the Channel Islands next month as one of the mouth-watering highlights at the four-day motoring spectacular. 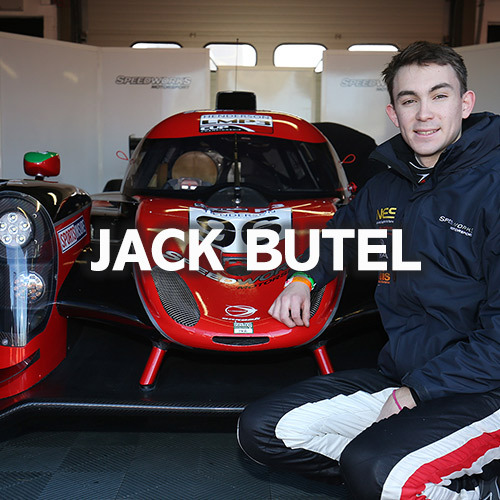 Butel made the transition from single-seaters to the closed-cockpit LMP3 sports prototype during the winter period and the Jerseyman already feels at home in the French car – clocking-up hundreds of miles in the machine at circuits across the UK and the picturesque Portimão in southern Portugal. On the opening round of the UK LMP3 Cup at Donington in April, Jack chalked up tenth and an impressive fifth for Speedworks Motorsport, the team that runs the 20-year-old St Saviour resident. Once the Channel Islander has finished racing his Ligier at the next round at Brands Hatch – Speedworks will return the car to Cheshire to prepare it for its journey to Jersey. The five-litre V8 weapon will travel from the UK on Thursday 1st June and be ready for the local star to take the wheel for a series of demonstration runs on the Friday evening sprint along Victoria Avenue – the islands only dual carriageway. Jack is set to entertain festivalgoers with the 420 bhp rear-wheel-drive machine, giving islanders a taste and flavour of LMP3 racing action. “I cannot wait to bring the LMP3 Ligier back home.” Enthused Jack. “Not many islanders get to see the car racing so I feel honoured to bring the car to Jersey and give everyone a close up experience of international sports car racing. I am looking forward to laying down some rubber on the roads on Friday night – as its quite a special moment to drive the car on roads that I travel on every day. For those wanting to enjoy life in the fast lane, Jack and Speedworks are offering hospitality at the festival. On either Saturday or Sunday, for £40 per adult, £20 for children aged 10–15 and free of charge for children under 10, you can enjoy the racing experience with food and drink in the teams racing unit. 10% of every ticket sale will go towards the Teenage Cancer Trust Jersey Appeal and Jack himself will be on hand to sign autographs and talk about the car and his exciting racing season. Every person will also be entered into a prize draw to win VIP tickets to a UK LMP3 round of their choice. To find out more and book your place on the grid, contact Derek Butel on 0779785772 or email derek.b@expressautoparts.je. Alternatively, tickets can be purchased from Express Auto Parts at Havre Des Pas.